Attention spans are dropping! Many people just won't watch a long video to its end where your call-to-action is. Use our short video messages to get your message across FASTER. Scroll through the content below to find the video you wish to post and/or advertise on Facebook. How Do I Download and Post the Videos to Facebook or Instagram? NOTE: For Instagram, you will need to visit this site via your phone and download the video directly to your phone or transfer the file from your computer to your phone. Looking for a new home around [Your City/Area]? SPECIAL: Now you can get FREE HELP finding it! Be sure to boost and/or share your post to increase exposure. Need symbols for your post? Need a different home style or price range? JUST ASK!! Request it free on the help page. Need another price range? No problem. Just send us a request on the Help Page here. Video specially-designed for targeting home buyers in USDA or Rural Development areas. Short, looping videos get more complete video views. Click to see example inside the private Facebook group. Sometimes "simple" is better. Target renters with a simple and obvious question. We are near a home sale peak and many realize it. Use this message to your advantage. Is downsizing your niche? Use this animation to grab your clients' attention. Use motion & sound to grab the attention of beach house buyers. Use motion and sound to attract attention to your website property search page link. 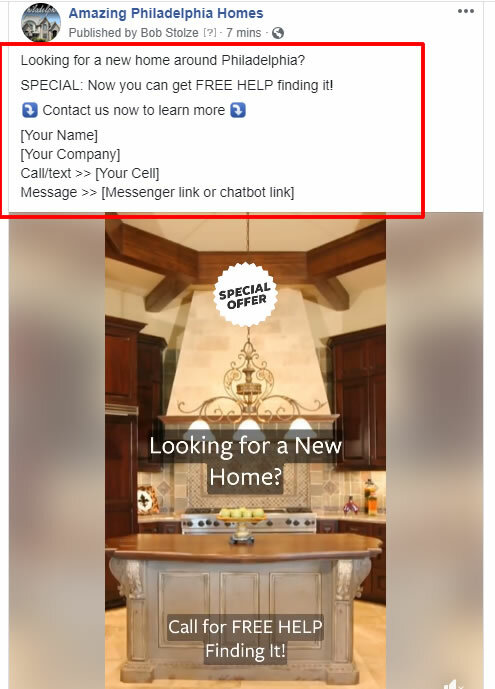 Use motion and sound to gain the attention of potential home sellers on Facebook. Attract Luxury Home Buyers with a simple list of high value homes. Want a different price range for this Animation? No problem, Just Ask Us on our Help Page! Entice folks to request a free home valuation. SHOW OFF your superior marketing skills! Be sure to write strong verbiage ABOVE your animated image on your FB post. Click here for an example. Renting? Buy & Pay Less Each Month. Want a Home Bargain? Free List of Foreclosures. Selling? STAND OUT with Better Marketing! Get Your Home SOLD Fast. And 2 new animations added every month!